Each machine is expandable with modular ATC magazine and APC. Compact and powerful horizontal machining center, the smallest in the series. 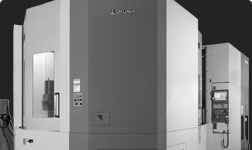 High-speed and productive horizontal machining center. Flexible and accurate horizontal machining center, available with 3-spindle options. Easy and efficient multitasking horizontal machining center, the largest in the series.